NEW DELHI - A poor government clerk from a desolate region of eastern India has become the first person ever to win $1 million on an Indian game show. Kumar's win echoes the plot of the 2008 Oscar-winning film "Slumdog Millionaire," whose impoverished protagonist won the grand prize on the show. 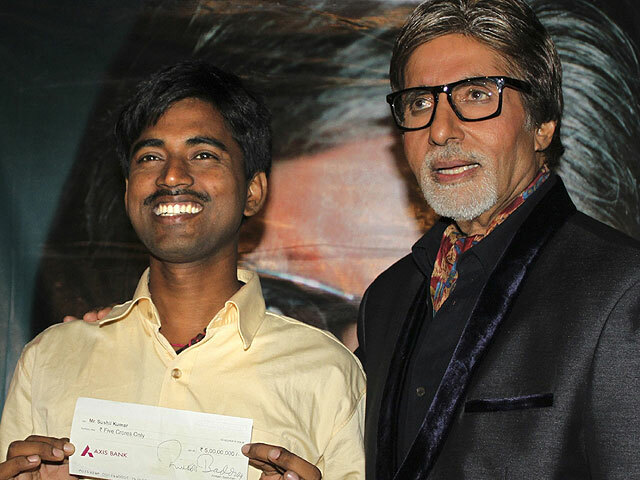 Kumar and his wife of five months wept when Indian movie legend Amitabh Bachchan, the show's host, handed them a check for 50 million rupees (just over $1 million) after the contestant gave all the right answers on the show. Kumar, 26, told viewers his family was so poor they couldn't afford a television set, forcing him to go to a neighbor's home to watch the quiz show. Watching him tick off correct answer after correct answer, his neighbors persuaded him to try out for the show, he said. He said he will also buy a new home for his wife, pay off his parents' debts and give his brothers startup cash so they can set up small businesses.